Artful Affirmations: Tea Cup Tuesday-Fall! Welcome to Tea Cup Tuesday where Martha and I invite you to visit and see our tea cups, and we hope we get asked over to your place to see yours! 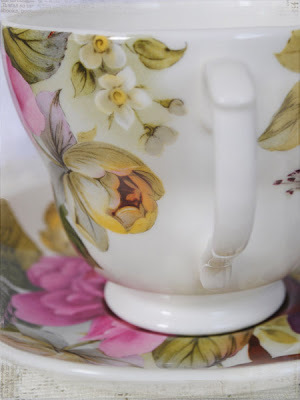 We love (really love) seeing your beautiful tea cups as well as stopping by to visit your blog. The coloring on this cup is very pleasing, with such pretty botanicals! The handle is a simple split loop and thumb spur without any adornment. 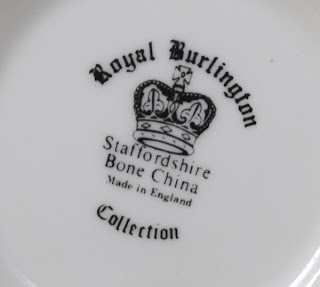 It was manufactured by Staffordshire China from England. But I found it at Ross For Less! This is the matching tea pot. It is quite small considering the size of the cup! Here is the second cup. Very cheery yet perfect for fall with it's oranges, peaches and greens. It also sports a unique "7" handle. I am not sure what flowers these are supposed to be, they look like apple blossoms or rosa rugosa to me. What do you all think? See the pale green edges? I do love this look! The inner rim of the cup has this same treatment only in pale pink. Also gorgeous! It is the little extra touches that make this cup unique. 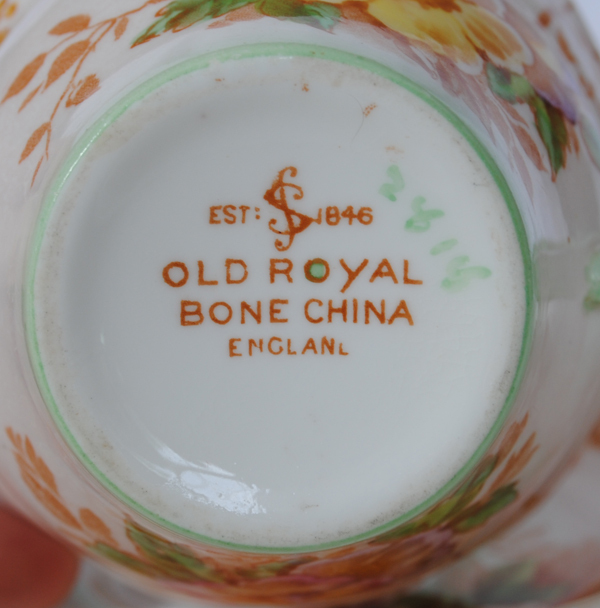 This cup was created by Old Royal Bone China. Since it does not say "Made In" I am thinking it is before 1920. Do you agree? I am so glad you were able to stop by! Blogger has been iffy for me for months now, but I am not going to give up the ship. After thinking about it for quite some time, I figure any host is going to have issues, and I don't want to trade for different ones! I have seen a number of you bloggers out there thinking of leaving Blogger too. Hopefully they will keep working out the issues. So I can visit AND leave comments at your blog! If you would like to play along with Tea Cup Tuesday, Please Remember, HAVE A TEA CUP IN YOUR POST! It is that simple. Most of you do this beautifully, but some lately have not had a tea cup at all or even just linked to a store page. I remove links that go to shops. Sorry about this, but I need to do a little moderating. 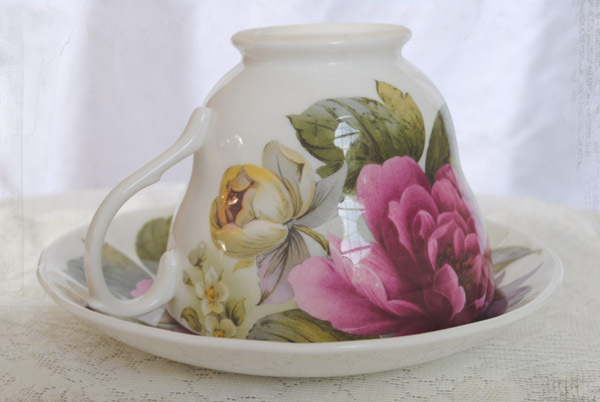 If you have a tea cup you would like to share, then go create your post and then come back here and link that post to Linky Tools below. Then we can come and visit you! Yay! I am having a giveaway to celebrate my new class beginning next Monday October 10th! If you haven't yet entered just click HERE to go to the post to comment. I will be announcing the winner at the end of this week! I love your Yellow flowers Tea Cup ,very autumnal,really lovely! Oh, Terri, I do love the rose teacup and teapot! My heart goes pitter patter whenever I see big gorgeous roses like these on china. Lovely, lovely! Thanks for sharing. Both of your teacups and that teapot are just beautiful Terri! thank you fr hsoting and have a lovely week! Love the matching cup and pot! The tea pot does look small next to the cup...does it do two cups worth? Love that big burgandy bloom! 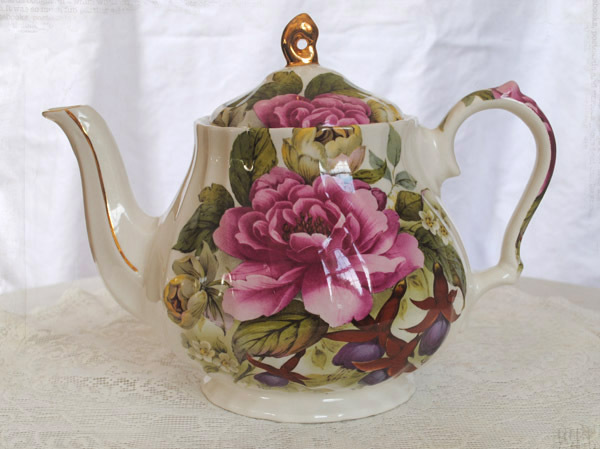 Terri, I especially love the wild rose teacup, with the green handle! So lovely! Thank you to you and Martha for hosting! What gorgeous teapot & teacups! I love the Old Royal...hand colored on transfer. A favorite of mine! Thanks for hosting TT! Your cups and teapot are lovely designs. I always enjoy floral patterns that are striking rather than tiny and dainty! I am often startled to see the disparity in size between a teapot and matching cup or even sugar and creamer. its frustating to have blogger problems instead of fun. But hopefully they wil find the problems and solve it. Your teacup and tea pot are breath taking. I agree fully, the design is outstanding. And the second tea pot is charming as well and so fall like. Thank you so much for sharing this beautiful treasures and for hosting this event with Martha. Your cups and tea pot are gorgeous and I agree with you that the second one must have been made before 1920. The flowers on it look like wild roses to me. in teacups, but I really appreciate them, and yours are just gorgeous. The rose teacup and tea pot are lovely, but the teacup with the oranges and peaches is calling to me! Maybe it's because of the fall colors!!! Happy Tea Day. I didn't see a linky. 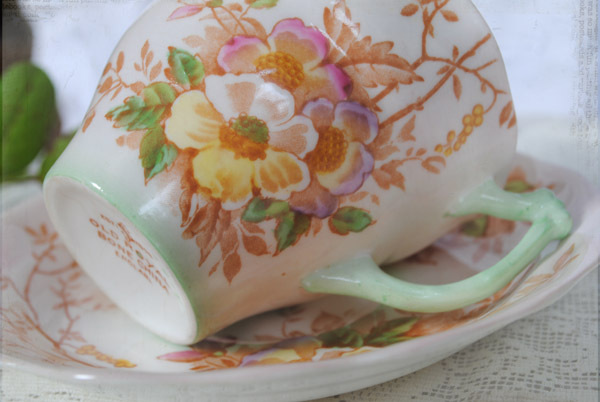 Hi there Terri - I so love the two teacups you're featuring today, but my fave is the second one. Love the combination of the colors, especially the green handle and edges. I cannot believe it's Fall already...Happy Tuesday dear friend! 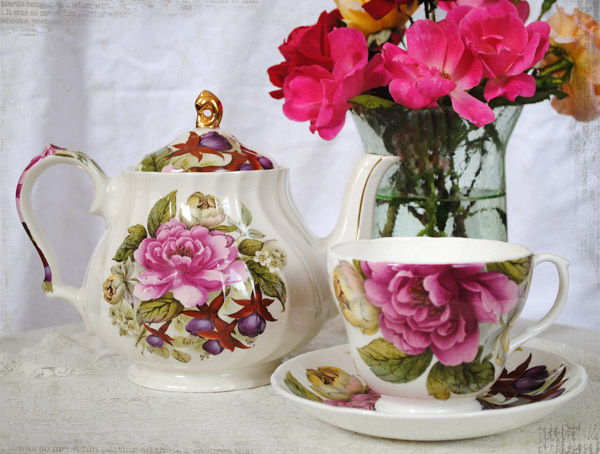 Terri, what beautiful cups...the rose cup and teapot are a burst of color and design. I like it very much. And the second orange and blossom cup is sooo lovely. You are right, it makes a perfect Fall tea cup, yet the colors are so pastel that they would be lovely in the spring and summer, too. I do love the green tint around the cup and handle. Purely delightful! I was going to share a forget-me-not set I have but forgot, so there's always next Tuesday...col.
What very pretty tea cups. I LOVE the big rose one -- but yes, it is odd that the tea pot is so relatively small, in comparison to that lovely big cup. Wonder what that thinking was? 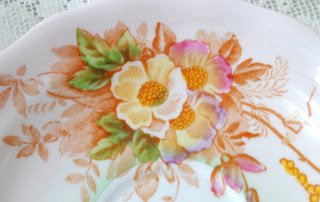 The yellows and oranges of the other cup are so delicate and wispy looking -- a very dreamy combination! I tried to link to your Tea Time Tuesday, but sure that I was successful...however, this would be my first time for Tea Time Tuesday! I think the pattern of your beautiful tea cups are so beautiful and I really enjoy your blog. Thank you so much for a beautiful Tuesday. Brenda from Down Memory La La Lane. Oh how lovely. The peachy one is especially eye-catching, since the colors are a little more unusual. I decided to join in for the time myself this week. Thanks for the inspiraiton. Hi Terri! Lovely teacups! Yes, I often see some real stunners at Ross and/or/ Marshalls. I always check out the home decor aisles first when I'm in those stores! Never know what you may find - and you really found a couple of winners! The large floral are lush - and your second teacup feature has fall colors! Great selections! Love those lush roses. Just gorgeous. I love your cups also this week, they are so beautiful- and especially the one with matching teapot is wonderful. Oh my gosh Terri that top teapot and tea cup are gorgeous! Your Royal Burlington teacup is beautiful. I like larger cups with easy to grip handles. 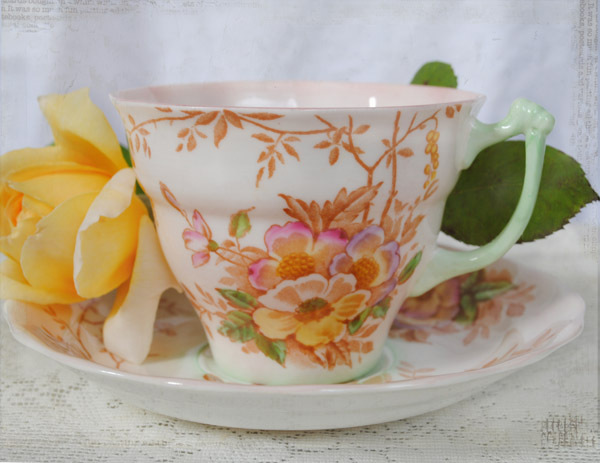 The Old Royal Bone China cup is also lovely with those pretty pastel colors and nice shape. Simply gorgeous teacups and what a charming tea pot!! They took my breath away!! love these gorgeous cups and darling tea pot! beautiful pieces as always! Another gorgeous post..I am in love with that sweet tea pot..gorgeous! Both cups are beautiful...magical!! 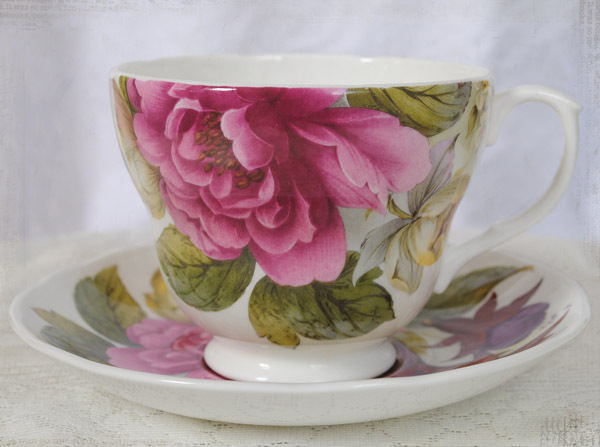 I love, love, absolutely adore these exquisite teacups, especially the second one! I have adored each and every minute with all of you, as well as all of our other fellow tea enthusiasts, teacup collectors and such like minded folks and ladies out there in blogland over the past several years; (I've actually been blogging since 2008). As always a lovely post from you Terri! I do like that you give out little bits about the type of handle, perhaps a date etc. Part of loving what you are doing :) No time for a post this week but will try and visit around. Re blogger, have you tried changing browsers? I now use Google Chrome and I am not having issues..that may be related to my e-mail being a Google one..but worth a try.